If you are reading this tutorial article, then you are obviously new to Embedded Wizard. We all from Embedded Wizard team would like to welcome you! With this tutorial we will show you the typical workflow and explain the most important concepts behind the technology. While reading this document you will be asked to perform diverse tasks (steps). You can recognize these by small yellow star marks (e.g. ). Please carefully follow the instructions. If you encounter any difficulty or you don't understand some aspects, please don't hesitate to use our Ask Embedded Wizard forum to post your questions. Usually, it takes between 60-90 minutes to complete this entire tutorial. 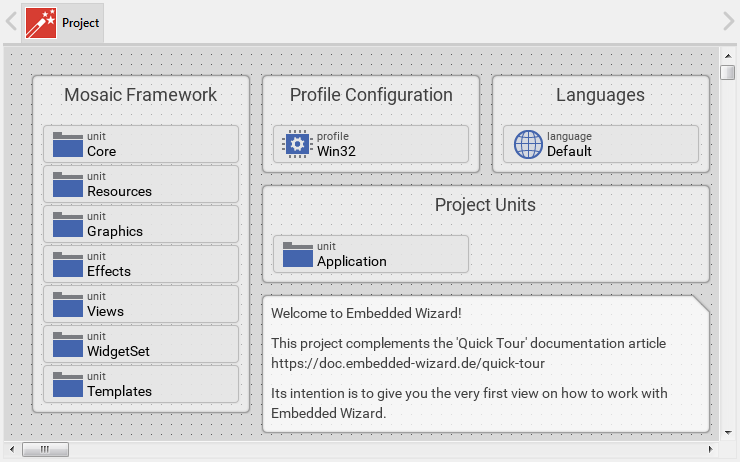 Also if you haven't read it yet, we recommend you check out the introduction article Welcome to Embedded Wizard. It provides a very superficial view of the technology, describes the requirements you should take into account and lists its most important key features. In the first step make sure that Embedded Wizard Studio 9.20 (or latest version) is installed on your desktop PC. If you have done that already, you can skip over this section. ★If you wish to try out our product, please visit Download Free Edition. Follow the instructions there on how to register. After registering you will be able to download the setup application for Embedded Wizard Studio Free. ★If you have licensed the professional edition (Embedded Wizard Studio Pro), we will provide you with the right setup application. ★Once you have downloaded the setup application, start the setup and follow the instructions. You can install Embedded Wizard Studio on a desktop PC running Microsoft Windows 7 or higher. If you are working on a Linux or macOS machine, we would recommend you to install Embedded Wizard within a virtual machine (e.g. VMWare or Parallels Desktop). To facilitate your entry into the new technology, we have prepared a small project called Quick Tour. 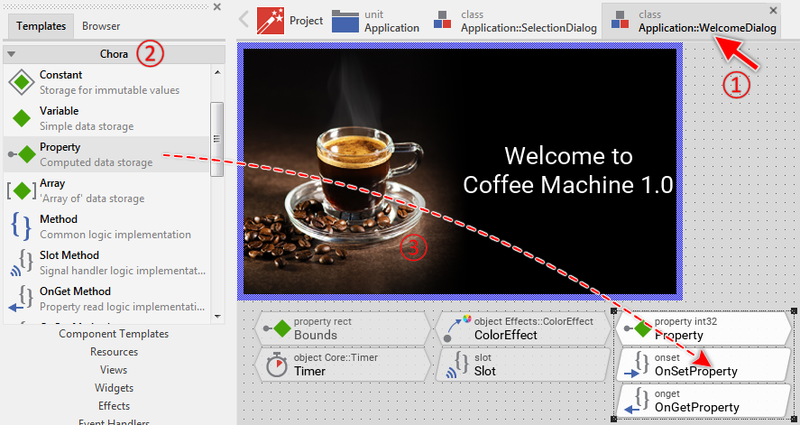 This project implements the GUI for a simple coffee machine. 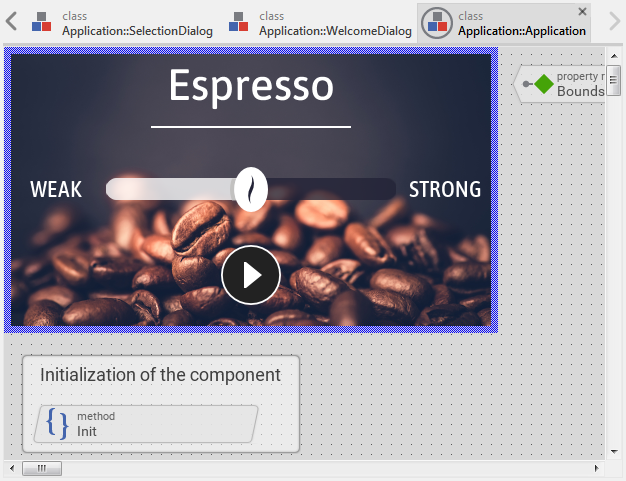 Through the GUI, the user can select how strong the coffee should be brewed and start the brewing process. Nothing more. Very straightforward. 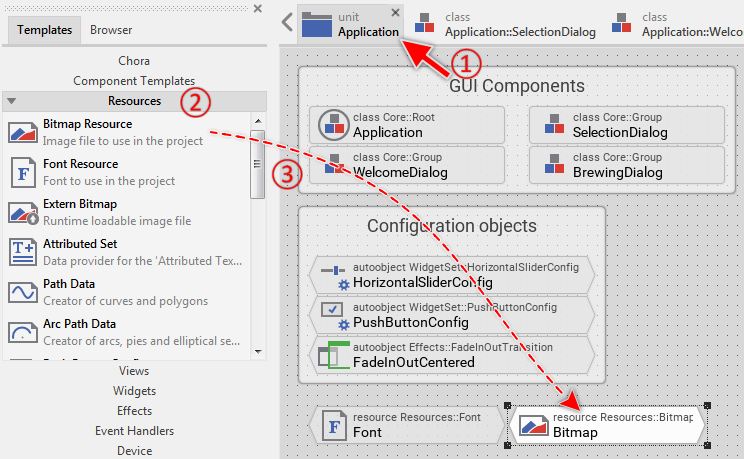 ★If you have not yet started Embedded Wizard Studio, now is the right time to do so. ★Open the sample by clicking on the button Open example project at the bottom of the dialog. 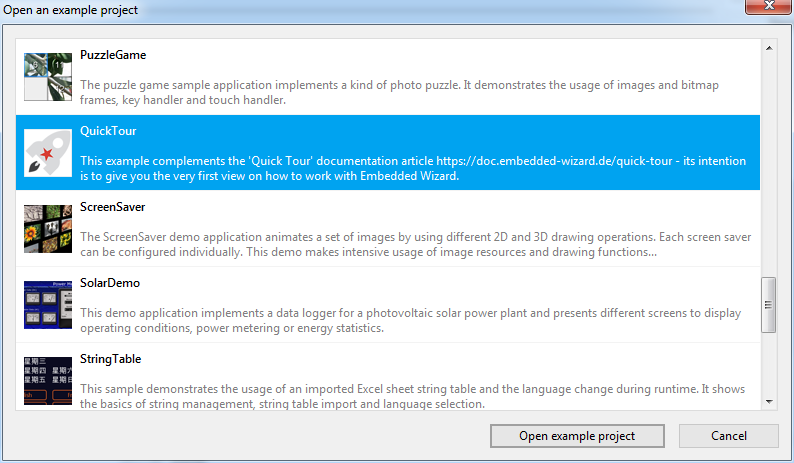 Please note, the sample Quick Tour is available in Embedded Wizard 9.20 or its latest version. Embedded Wizard Studio provides a powerful integrated development environment permitting you to simply design, test and customize your GUI application. The workflow is based on the idea of visually aided programming, where software entities are arranged and connected with the mouse by dragging & dropping them. From our point of view, it was self-evident to combine visual programming and the GUI application development – both concepts complement each other. In this manner, you compose the appearance of an application and implement its complete functionality. No further development tools are needed. 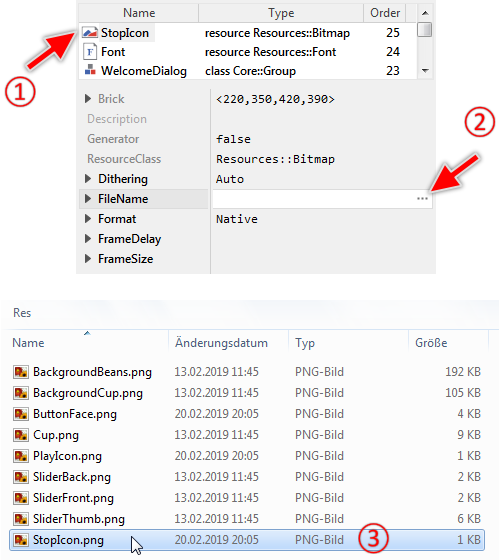 The Profile brick Win32 exposes, beside others, the attributes PlatformPackage and ScreenSize. As you see in the screenshot above, the attribute PlatformPackage is actually configured with the value Tara.Win32.RGBA8888. This means, by using this profile, the Embedded Wizard will generate a code optimized for Microsoft Windows operating system (Win32) with RGBA8888 as a native color format for all images. Selecting another value in this attribute would allow you to generate code for other target systems or color formats. The attribute ScreenSize, as you probably deduced, determines the desired target display resolution (here 480x272 pixel). In the case of Windows as a target system, this gives a hint about the dimension of the window when the application is running. If you intend to create an application, for example, for Raspberry Pi, you will configure this attribute to correspond to the native resolution of the LCD in your target system. Depending on the type of project member, the corresponding brick may contain further embedded members. You can reveal them by simply double-clicking on the member - similarly to how you open a folder in Windows File Explorer. Please take a look at the brick named Application. Bricks of this type represent in the project the so-called units. The unit is where you put your concrete implementation - analog to a *.cpp file in a C++ development system. Within the unit, all enclosed members are similarly represented by bricks. In the figure above you can see many of them with different icons and names. In particular, please note the bricks with pointed edges. Such bricks represent data entities - they store information. For example, the brick BackgroundBeans (in the top-right corner) serves as a bitmap resource - it contains an image. Among the various attributes of the just selected brick, please note the attribute FileName. This attribute addresses the image file to associate with this bitmap resource. When generating code, Embedded Wizard converts this image file into a format that is appropriate for the target system. This usually includes the color reduction and compression. Later, when you want to display the image, you simply refer to the member BackgroundBeans. The just selected brick SmallFont represents a font resource. As you see in Inspector, the font resource is configured with the font name Asap Condensed Medium and the font size of 29 pixel. Again, when generating code, Embedded Wizard will automatically convert the specified font in a format that is appropriate for the target system. This usually includes the rasterization and compression of all affected font glyphs. Later, when you want to display text with this font, you can simply refer to the member SmallFont. 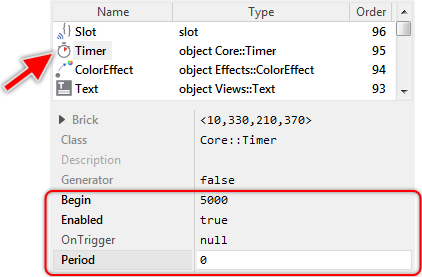 In the upper text row of the selected brick, you will see the expression WidgetsSet::PushButtonConfig. This expression identifies a class from which this object is instantiated. The particular ancestry of the object is also reflected in its icon, here you will see a small button with an associated gearwheel as a symbol for configuration. Embedded Wizard follows an object-oriented approach to structure and implement GUI applications. This means, in practice, when developing a GUI application, you need to create and implement classes. Objects are instances of the corresponding classes. The above-mentioned autoobjects are nothing else than global instances you can access from everywhere in your project. A class, in turn, can implement either a visual GUI component (like the push button) or a non-visual component (like the configuration object). The class WidgetsSet::PushButtonConfig implements such non-visual configuration component. In the screenshot above, please note the four properties FaceActive, FaceDefault, FaceDisabled and FaceFocused. They determine the bitmap resources to display in push buttons using this configuration object. In other words, when you connect a push button with the configuration object PushButtonConfig, the push button will use the specified bitmap resources for its appearance. 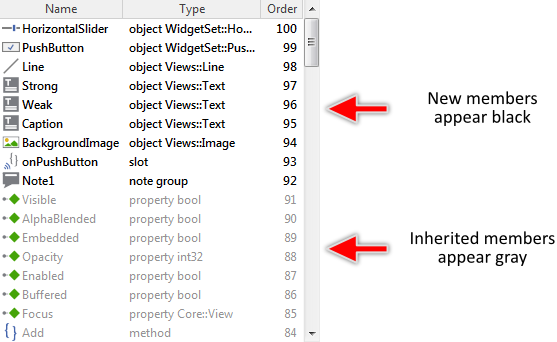 In particular the unit WidgetSet implements all widgets (including the push button component) as well as the associated configuration objects. Every unit, by the way, serves as a namespace for its enclosed members. This avoids eventual name conflicts with homonymous members existing in other units. For example, the class name WidgetSet::PushButtonConfig addresses the class PushButtonConfig within the unit WidgetSet. 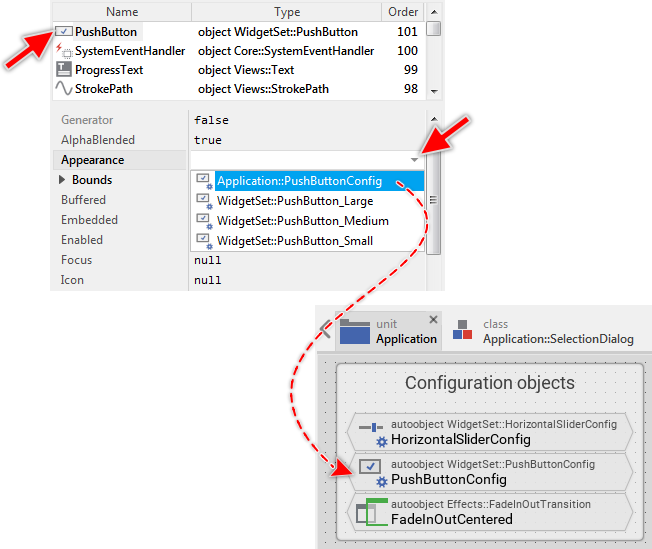 As such, it does not interfere with the homonymous autoobject PushButtonConfig existing within the unit Application. Both coexist within the same project. 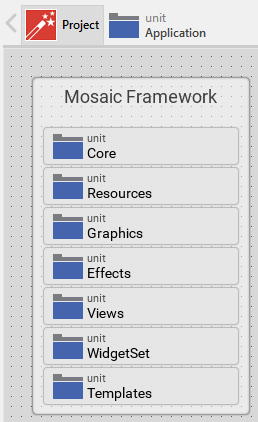 These three bricks are classes implementing (visual) GUI components. 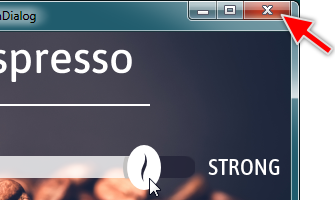 For example, the brick SelectionDialog implements a screen (we call it dialog) where the user can select the desired strength of the coffee to prepare. The brick BrewingDialog, in turn, implements a dialog showing the progress of the brewing process. In practice, when developing a new GUI application, you will first reflect on the components needed to assemble it. Here you will list all dialogs (screens) the user may interact with as well as any other subordinated widget the application should contain (e.g. 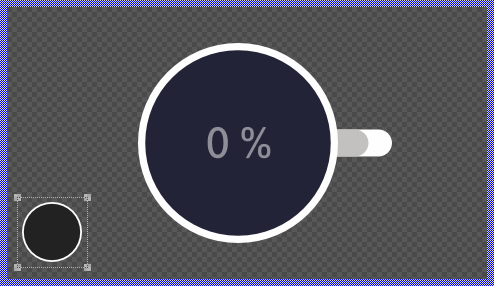 a push button, slider or progress bar). Then, in the second step, you implement every identified component as an individual class. Most especially, take note of the attribute SuperClass of the just selected brick. 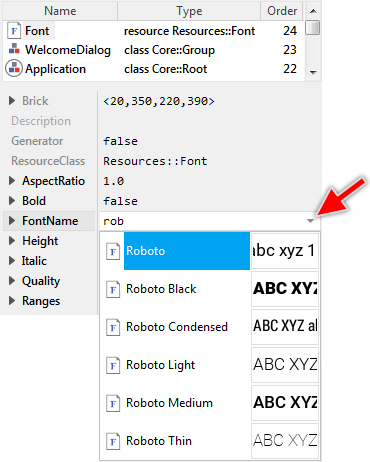 It is actually initialized with the expression Core::Group (by the way, the same value is also displayed in the upper text row of the brick). This expressions indicates, that the class SelectionDialog descends from another class Core::Group. This super class, in turn, is implemented in the Mosaic framework (the basement of every GUI application) we have explained shortly before. The class Core::Group implements a lot of common functionality needed by almost every GUI component. It takes care of screen updates and dispatches incoming user input events (received e.g. from a touch screen or keyboard). By descending from it, the class SelectionDialog inherits all this functionality implicitly. It is not necessary to re-implement this functionality again. In the derived class, you just add new contents specific to this component. This is one of the advantages of the object-oriented approach. The contents of the class SelectionDialog appear in a new Composer page. This Composer, however, is something different. In the top-left corner, you will see an area surrounded by a thick blue border. This area is called Canvas. What you see within this area will also be visible on the display in your target device. 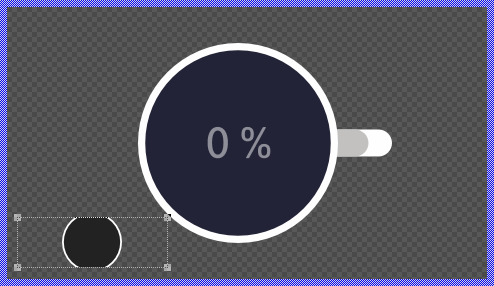 The Canvas area is available only when the actually-edited class does represent a visual GUI component. 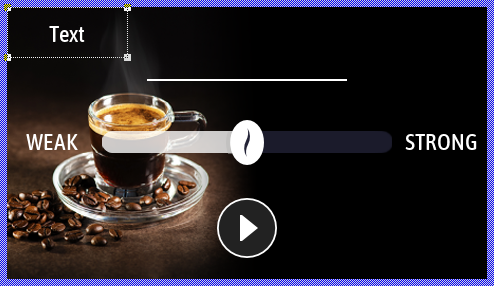 In our tutorial example, this GUI component permits the user to select the desired coffee strength and to start the brewing process. Typically, complex GUI projects will consist of many different GUI components, which depending on the user interaction appear and disappear on the display. The SelectionDialog component implements, thus just one of the GUI components. Now please take a look at the Inspector window. In its upper area, you will see a list of members. 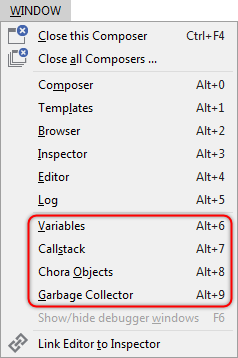 As you have probably noticed, this list always corresponds to what you see in Composer. When working with Embedded Wizard, you can select the members either in Composer or in Inspector. Both work coupled together. Within this list, you can also rename the members if desired or rearrange their order if necessary. The difference roots in the object-oriented characteristic of Embedded Wizard. In this concrete case, the actually edited class descends from the superclass Core::Group. As explained above, the descending class inherits all the functionality implemented in the superclass (and also implemented in all higher superclasses). Displaying all those inherited members in Composer would quickly become confusing. Therefore, when you edit a class, the Composer conceals implicitly the bricks for members defined in the ancestor classes but not overridden in the actual class. In other words, the Composer shows only those bricks which are added or modified in the actual class by hiding all other inherited and not overridden bricks. The Inspector, in turn, always displays all members. Those, which are inherited appear in Inspector in gray color. New members added to the actually-edited class appear black. In this manner, you can recognize the origin of a member easily. Till now, we limited to analyze the contents in the sample project. You learned what the bricks are and how to navigate in the project. 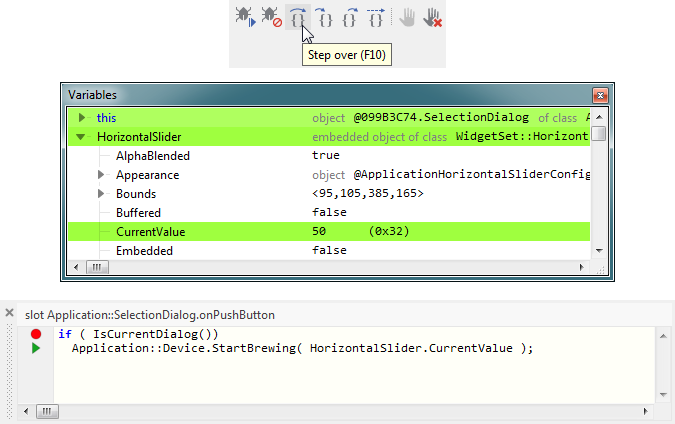 In the next steps you will learn how to modify the existing GUI component SelectionDialog. ★In the top-left corner of the Canvas area, you will see Text. Click on it to select the corresponding member. 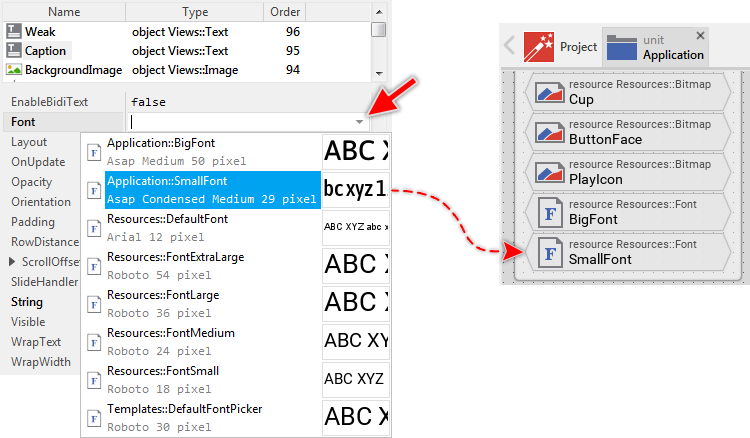 ★As long as the text view is still selected, look in the Inspector window for the view's property Font. Assistant windows are convenient tools to easily select the adequate value when modifying a property or attribute. While working with Embedded Wizard, you will use them very often. In this concrete case, the Assistant from the screenshot above is intended to list all font resources existing actually in the project. 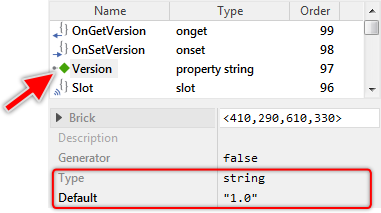 ★Now look in the Inspector window for the text view's property String. 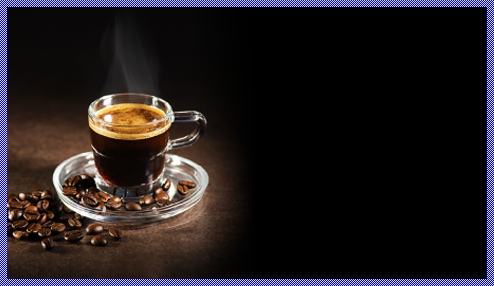 ★Click on the property and enter the text "Espresso" (Be aware of both double quote signs which are part of the expression). ★As next select the background image view. To do this you can click in Inspector window on the corresponding member BackgroundImage or directly on the corresponding view on the canvas area. ★On the right of the property Bitmap, click on the small icon to open the associated Assistant window. Now it's time to test whether the component is working as expected. Embedded Wizard implements for this purpose the so-called Prototyper, a kind of virtual machine able to instantly interpret and execute the GUI application without needing to start an external compiler and load the resulting binary to the target system. ★Thereupon a Prototyper window appears. Within this window, play around with the GUI component. You can, for example, click and drag on the horizontal slider. Also, try to click on the round play button in the bottom area of the tested GUI component window. As you saw, the GUI component worked. You were able to drag the horizontal slider and the appearance of the slider changed accordingly. Uniquely, pressing the round play button had no practical effect. This is because we started the Prototyper directly with the component. You can imagine, the component was running outside the remaining application. This test mode is thus ideal if you intend to test the component insulated from other parts existing in your application. ★Close the Prototyper window again. As you have noticed, activating the push causes a new component to be displayed. How is it achieved? Among the diverse bricks you learned in the course of this article, Embedded Wizard also provides bricks, permitting the implementation of your desired functionality. With these bricks you are flexible to code the behavior of the application. ★In the Canvas area of the Composer, click on the round play push button to select it. 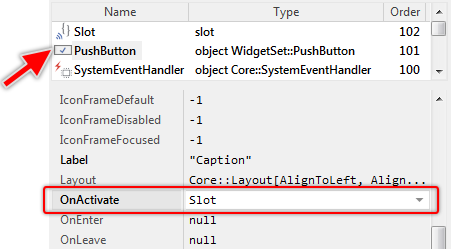 As you see from the screenshot above, the button's property OnActivate is actually initialized with the expression onPushButton. This expression, in turn, addresses the homonymous brick - a so-called slot method. At the runtime, when the push button is activated, the button will send a signal to the associated slot method and trigger so its execution. The slot method thus serves as a functioning entity, which can be recognized by the beveled edges of the corresponding brick. The slot method, after successfully evaluating an if-condition, invokes a method (in the language C, you would say function) named StartBrewing. The method is invoked in the context of a global object (an autoobject) Device existing within the unit Application. As you remember, at the beginning of the article, we have explained that the object Device, as well as the both accompanying bricks (e.g. DeviceClass), build the interface to the underlying device. 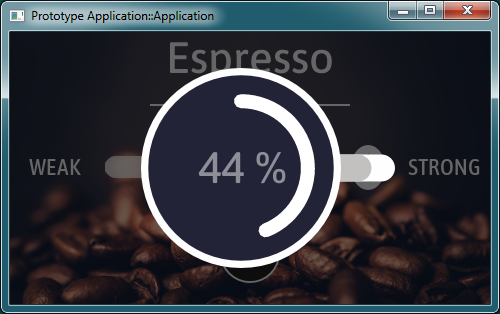 When invoking the method, the CurrentValue stored in the object HorizontalSlider is evaluated and passed to the method as a parameter (the value corresponds to the actual position of the coffee strength slider). That's all. For the moment, it is sufficient to understand, that StartBrewing controls the brewing process in the device - it activates the heater, the water pump and depending on the value passed in its parameter, it regulates the duration of the brewing. We will analyze its implementation later. 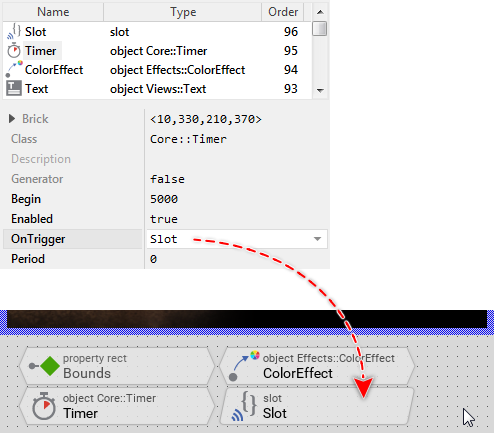 ★In the Code Editor, click within the first code row so the blinking caret appears there. ★Now, start the Prototyper again by using the shortcut CtrlF5 to test the entire application. While the execution is paused, a small green triangle appears in the Code Editor, indicating the next statement to execute. Additionally, new window Variables is shown. 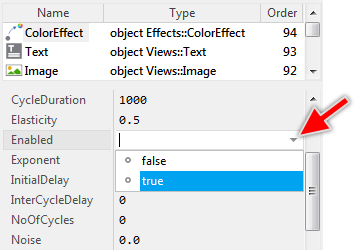 In this window you can actually see the unique value this, which refers to the object in the context of which the executed method has been invoked. It represents the actual object. By clicking on the small gray triangle on the left of this, you can expand and inspect the values contained within it. ★Now remove the breakpoint again by clicking on the tool button Remove all breakpoints. ★Then click on the tool button Continue to resume the application execution. ★Finally, close the Prototyper window again. 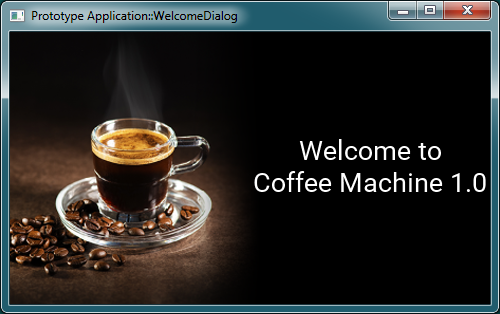 So far our coffee machine GUI project consists of two dialogs (screens). The SelectionDialog allows the user to specify the desired coffee strength and to start the brewing process. The BrewingDialog, in turn, displays the progress of the running brewing process. 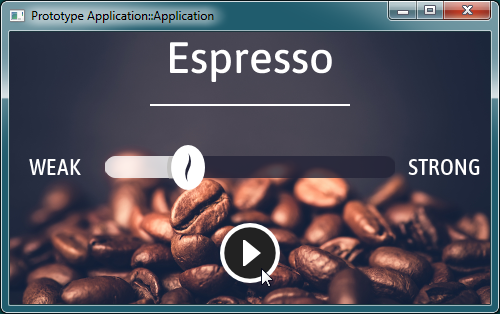 Now let's assume, we would like to extend the application by a third dialog, a welcome screen, which should appear just in the moment when the coffee machine is switched on - when the GUI application starts. To implement such a welcome screen, you will need to add to the project a new class descending from the Mosaic class Core::Group. You remember, the class Core::Group implements the functionality common to all GUI components. Deriving a new class from it would result in a new GUI component. For your convenience, the Embedded Wizard provides a gallery of diverse ready-to-use templates that you can simply drag & drop to the Composer and so add a new class. ★In the Navigation bar (the area just above the Composer), click on the tab corresponding to the unit Application. Thereupon you will switch to this Composer page. ★In the Gallery window (on the left of the Composer), click on the item Component Templates. This reveals the contents of the homonymous Gallery folder. 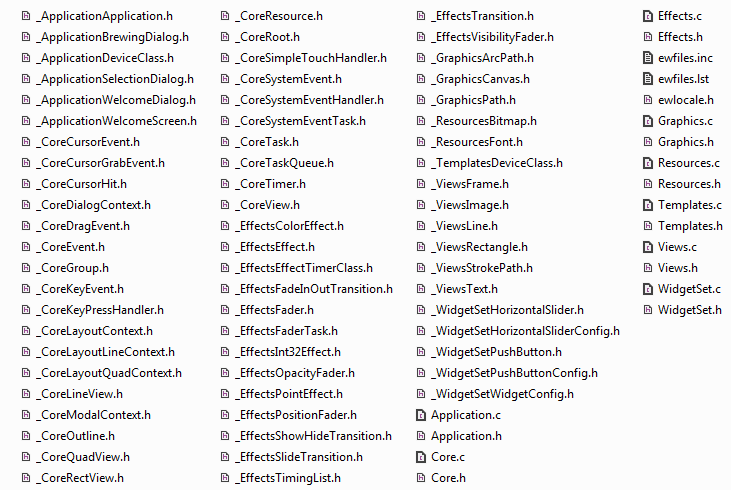 ★Within the folder Component Templates, look for the item Component. ★Click on the item Component and drag it to the Composer. The checkerboard pattern in Canvas represents the actual screen background. With it, you can easily distinguish during the design how transparent or semi-transparent the areas of the component will in fact be composed with other screen contents lying behind them. ★Click on the brick UpdateViewState and press the key Del to delete it. ★Repeat the operation with the brick UpdateLayout. ★Then click on the big annotation member containing the Text To do: and also delete it. Please don't delete the brick Bounds! ★Click on the right edge of the thick blue border enclosing the Canvas area and drag it until the Canvas has assumed the width of 480. 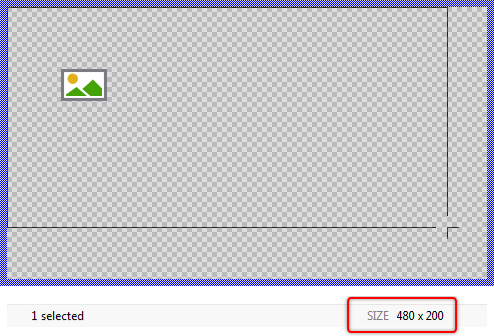 During the resize operation, the actual size is displayed in the status bar at the bottom of the Embedded Wizard window. ★Now, repeat the operation and drag the bottom edge of the Canvas border until the Canvas has assumed the height of 272. 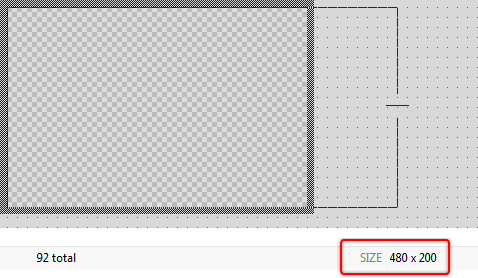 Press the key Shift during the drag operation to resize the Canvas exactly without the fixed grid. 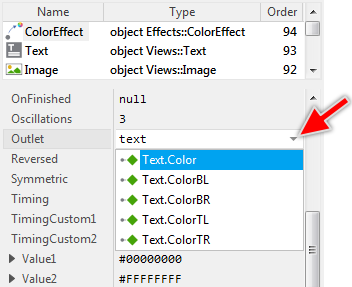 ★In the upper area of the Inspector window, look for the member this (it represents the actually-edited component). Select this member. 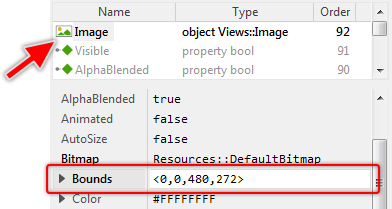 ★Now, in the middle area of the Inspector window, look for the property Bounds. ★In the Gallery window, click on the item Views. This reveals the contents of the homonymous Gallery folder. ★Within the folder Views, look for the item Image. ★Click on the item Image and drag it to the Canvas area. ★Move the just added view to the top-left corner of the Canvas area. For this purpose, click on the view and drag it with the mouse. 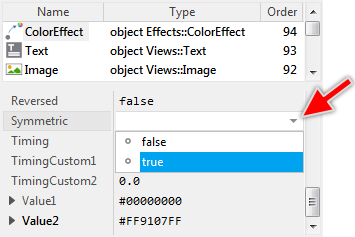 ★As long as the image view is still selected, look in the middle area of the Inspector window for the view's property Bounds. ★Modify this property to the value <0,0,480,272> and confirm the modification by pressing the key Enter (Be aware of the angle brackets which are part of the expression). 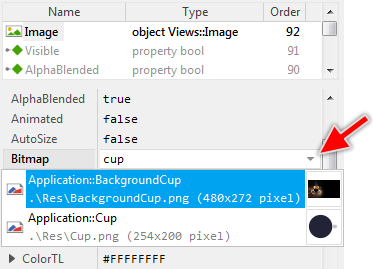 ★As long as the image view is still selected, look for the view's property Bitmap. ★While the Assistant window is visible, enter the text cup. The entered text serves as a filter for the entries shown in the Assistant window. ★In the Gallery window, make sure that the folder Views is still opened. ★Within the folder Views, look for the item Text. ★Click on the item Text and drag it to the Canvas area. ★Arrange the just added text view to occupy the right half of the Canvas area. ★Navigate again to the unit Application. This is important since the font resource, like any other global entity, may exist within a unit only. You can't add the font to a class. ★Then, in the Gallery window, switch to the folder Resources. ★Within the Gallery folder, look for the item Font Resource. ★Click on the item Font Resource and drag it with the mouse to the Composer. 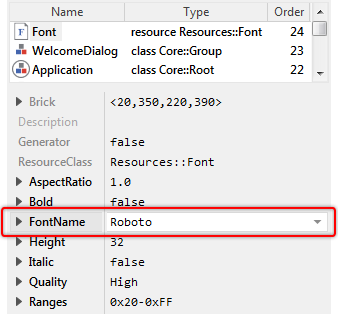 ★In the middle area of the Inspector, look for the attribute FontName of the just added font resource. ★Switch back to the Composer for the class WelcomeDialog. ★Make sure the text view is still selected. ★Look for the view's property Font. ★Open the Assistant window associated with this property and enter the text app to filter the displayed entries. ★In the Gallery window, switch to the folder Effects. 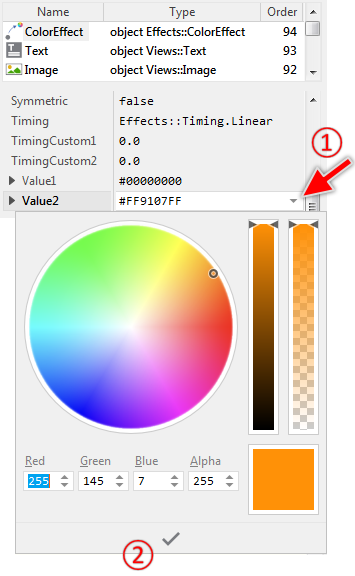 ★As long as the just added color effect member is still selected, look in the middle area of the Inspector for its property Outlet. ★Open the Assistant window associated with this property and enter the text text to filter the displayed entries. ★Finally, press the key F5 to start the Prototyper. ★After a few seconds, close the Prototyper window again. When the Prototyper open, you will see the text fading-in repeatedly with a period of 1 second. The text is flashing. From a technical point of view, this animation is controlled by the just added color effect member. 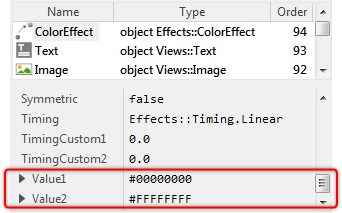 At the runtime, the effect interpolates a value between two predetermined key values and assigns the result of this operation to the foreign property referenced via its own Outlet property - here, the property Color of the text view. We can say, the color effect remotely controls the property of the text view. The property Value1 determines the value valid at the begin of the animation and the property Value2 determines the value at its end. Actually, the property Value1 is initialized with the expression #00000000 - meaning a transparent color. The property Value2, in turn, describes a fully opaque white color (expression #FFFFFFFF). Both expressions are color literals written in Chora syntax. These always consist of 8 hexadecimal digits in the fixed order #RRGGBBAA (RR:red, GG:green, BB:blue, AA:alpha). ★Click on the property Value2 and open its Assistant window. ★In the Assistant window, select the orange color. ★Press the key F5 to start the Prototyper. ★Again after a few seconds close the Prototyper window. The welcome dialog is working now as we expected. The text is flashing with orange color and after you have modified the property Symmetric, the animation effect runs forth and back between the key values instead of skipping at the end of the animation. ★Before you continue with the next step, close the Prototyper window again. ★Switch back to the unit Application. The class Application, as the name reveals, represents the entire GUI application. Its content corresponds to what you see on the display in your device. 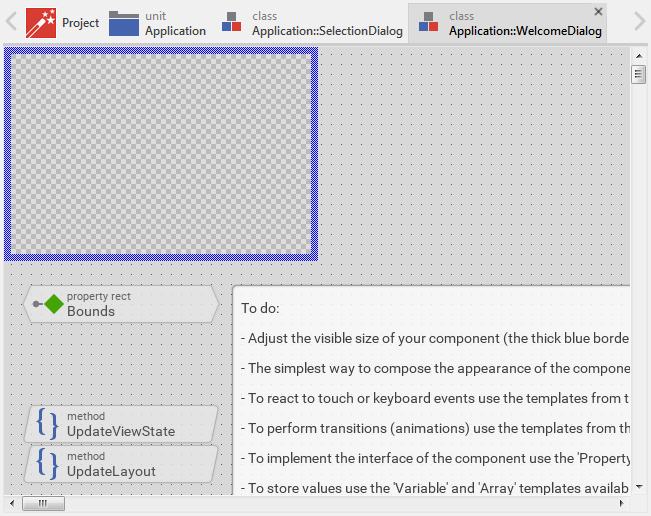 When you add a view (or another GUI component) to the application component, this view appears on the display implicitly. Considering a GUI application as composed from interleaved, nested view objects, the application component serves as the root of this tree-like structure. Therefore, we tend to call the instance of the application component as the root object. From a technical point of view, the application component is an ordinary GUI component enhanced by an additional interface permitting its integration with the display in your device. This is possible because application components are derived from the Mosaic class Core::Root, which, in turn, descends from the class Core::Group serving as the base class for all GUI components. 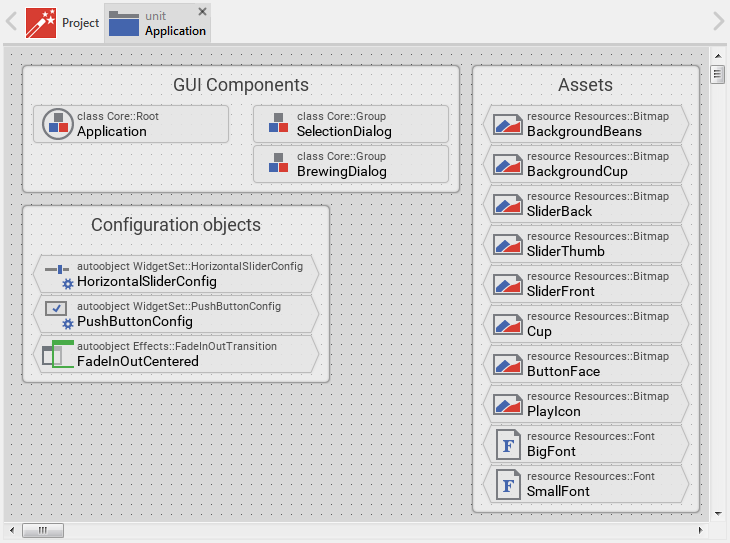 Thus an application component inherits the functionality every ordinary GUI component supports per default. In other words, the application component is just another GUI component. You see the ancestry of the Application class in the upper text row of the corresponding brick. 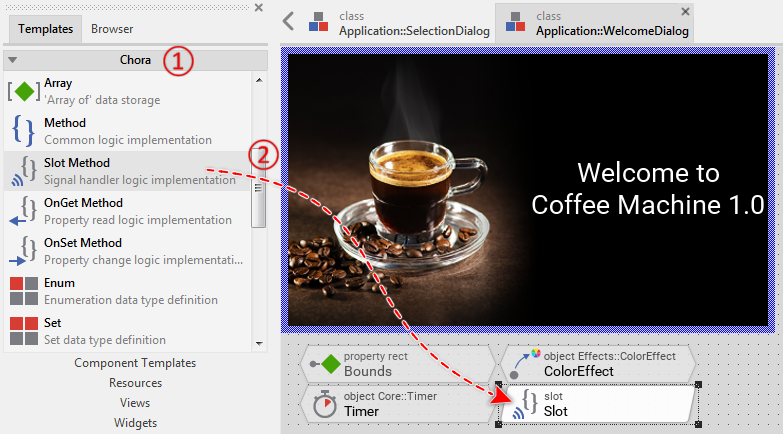 The first object is an instance of the class Application::SelectionDialog. We have analyzed this class in the preceding sections and as you remember, it is designed to represent the selection screen GUI component. 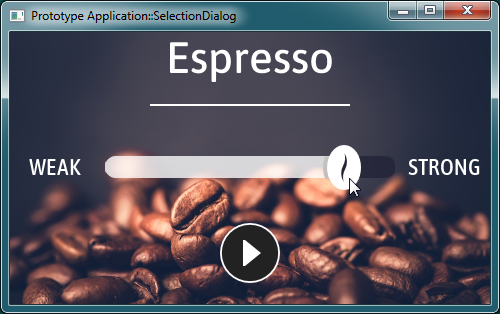 Being a part of the application component, the SelectionDialog object implicitly becomes visible. 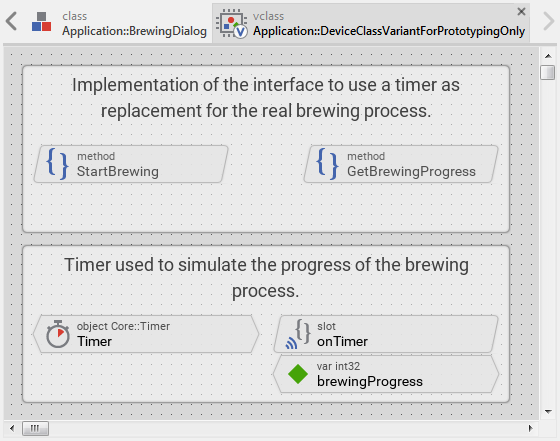 The second object BrewingDialog is, in turn, an instance of the class Application::BrewingDialog. It represents the screen, which is shown during the brewing process only. Actually, it is hidden, so you can't see it. 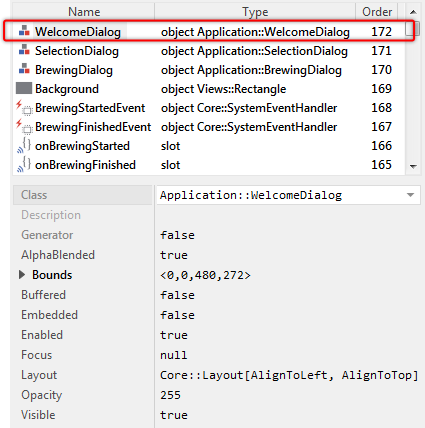 Regardless of whether the BrewingDialog is actually hidden or not, its visibility is also affected by the stacking order of objects within the application component. You can see the stacking order in the Inspector column Order. 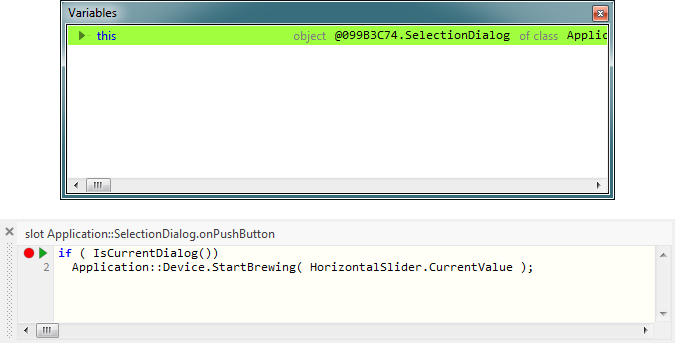 Accordingly, the SelectionDialog has a higher order than BrewingDialog and overlays it. ★In the Gallery window (on the left of the Composer), switch to the Browser view. ★Enter in the Search ... edit field the text welcome. It serves as a filter for the displayed entries. ★Drag the selected item Application::WelcomeDialog to the Canvas area. ★Release the mouse within the Canvas area. ★Just below the Canvas area, look for the brick Init. The method Init is automatically executed, just in the moment when an instance of the corresponding class is created. If you are familiar with object-oriented languages like C++, you can compare Init with a constructor. According to the above screenshot, the Init method invokes a PresentDialog method with SelectionDialog object as a parameter. What PresentDialog exactly does is beyond the scope of this Quick Tour article. For the moment, it is sufficient to understand, that this operation controls the navigation within the application. It makes the SelectionDialog to the component, the user actually interacts with. // ... and overlay it by the 'welcome screen'. ★Press the shortcut Ctrl+F5 to start the Prototyper for the entire GUI application. With the above modification, you made the WelcomeDialog to the component that the user actually interacts with. The SelectionDialog moves to the background and is not visible anymore. From this arises the problem where WelcomeDialog remains permanently visible so you can't interact with the SelectionDialog anymore. Solution: the welcome screen should disappear automatically after a short period of e.g. 5 seconds, restoring the underlying SelectionDialog. ★In Composer, switch back to the WelcomeDialog. As you have already learned, you do this by clicking on the corresponding tab in the Navigation bar. 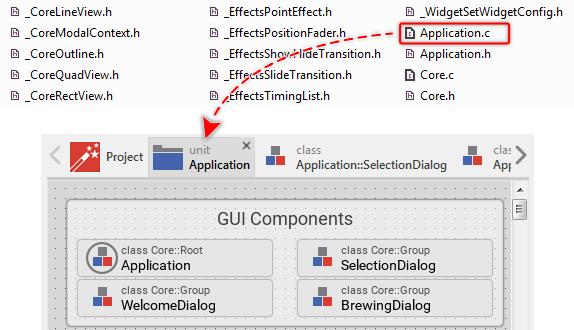 An alternative approach is to double-click in Composer on the displayed component or in Inspector on the corresponding member WelcomeDialog. ★In the Gallery window, switch to the Templates view. ★Then open the folder Effects. ★Now open the Gallery folder Chora. 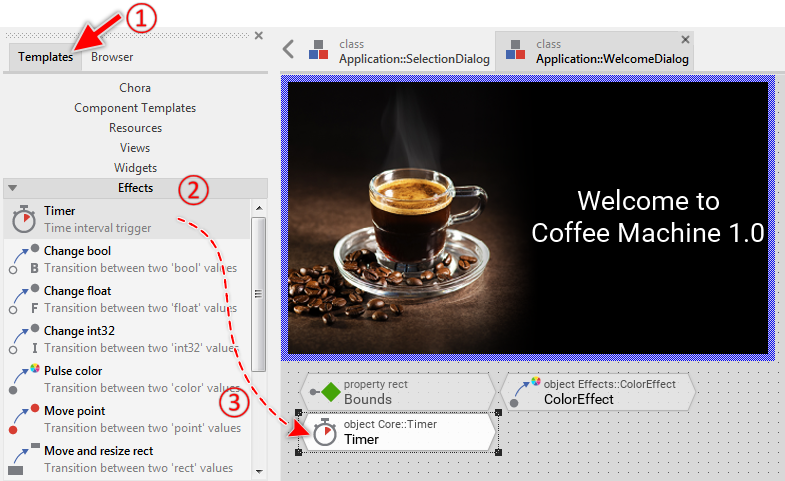 ★In the Composer, select the previously added Timer object. After being triggered by the timer, the slot method will invoke the method DismissDialog with this as a parameter. DismissDialog is the counterpart of the above used PresentDialog method. In our concrete example, the invocation of DismissDialog hides the actual component (this), restoring the previously presented component SelectionDialog. The user should be able to interact with the selection screen now. Please note, DismissDialog is called in the context of Owner. Owner is a variable referring to the component which actually displays this component. Since the welcome screen is embedded within the application component, Owner refers to the instance of the application component. The method DismissDialog is thus invoked in the context of the application component, which is important since the corresponding PresentDialog was also called in the context of the application component. Now, the welcome screen disappears automatically and you can interact with the selection screen and start the brewing process. The unique irritating aspect is the long period of 5 seconds to wait until the screens have been exchanged. Solution: let's enhance the welcome screen so that it is dismissed when the user touches it. 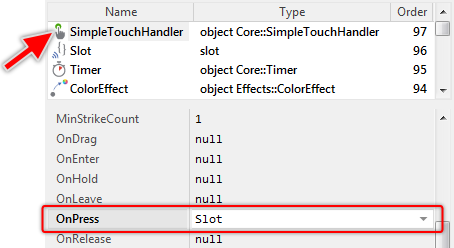 ★As long as the touch handler is still selected, look for its property OnPress. Now, you can dismiss the welcome screen just by touching on it and without having to wait for the timer expiration. Thus, the welcome screen is integrated within the application and it works. Nevertheless, we can make it better. Actually, when you dismiss the welcome screen, the transition to the selection screen occurs immediately. An animation would be nicer. The many parameters of PresentDialog configure the transitions (animations) to perform when dialogs are presented and dismissed. 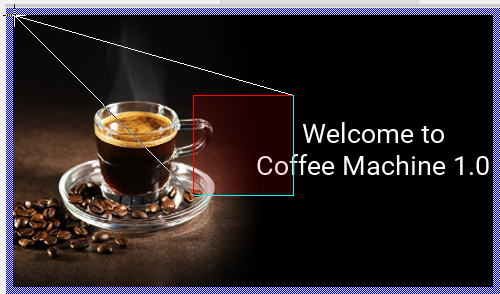 With the above modification, you have specified the slide up animation to apply on the welcome screen and simultaneously on the component overlaid by it (in our case on the selection screen). Thus when the welcome screen is dismissed, the dialogs are exchanged with a slide up animation. The concrete parameters for this animation (duration and timing) are preconfigured in the specified Mosaic transition object Effects::SlideUpCentered. This object exists for your convenience only. 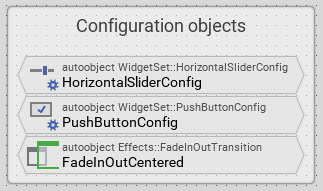 In praxis, you can configure your own transition objects according to the desired animation parameters. ★Press the shortcut Ctrl+F5 to start the Prototyper for the entire GUI application. Now the transition between the screens is performed with an animation. In the practice, when you create a new GUI component, you will also design an interface permitting the configuration of the component instances at the design and runtime. Let's imagine an ordinary push button component. Such push buttons usually display a caption or an icon indicating the particular function of the button within the application. Without the possibility to configure the button, it would be necessary to implement every button as an individual component with its individual caption or icon. By implementing an interface, it is sufficient to have a generic button component with the caption or icon being configurable via the interface. The following section demonstrates how you add such interface to our welcome screen component. As you remember, the welcome screen displays a text containing the version number of the device. Now let's assume, this version number varies depending on the device hardware used. Our interface should thus allow to explicitly specify the version number to show on the welcome screen. In Embedded Wizard, you use for this purpose so-called properties. The property can be considered as a variable. It stores data within the component and every instance of the component may store different data. The difference to the ordinary variable is that every time the property is modified (a value is assigned to the property), an associated onset method is executed. Within the method, the component can react to the alternation of the property and, for example, update its appearance. In our concrete case, the property should store the version number and modifying the property will update the text shown in the component. ★Switch back to the component WelcomeDialog. ★Select the first brick Property of the three just added and press the key F2 to rename it. ★Enter in Inspector the new name Version for the property and confirm by pressing the key Enter. From the screenshot above, you can see the Code Editor with the actual (default) implementation of the onset method. Interesting in this context are the used keywords pure and value. With pure, the implementation can access the memory where the property actual content is stored. The keyword value, in turn, represents the new value just being assigned to the property. // The value doesn't change - nothing to do. // Remember the property's new value. With the last code line, the onset method performs an assignment to the property String of the object Text. The assigned expression is a string resulting from the concatenation of a string literal (enclosed between the double quote signs) and the new value of our property. The concatenation itself is expressed by the + (plus) operator. Accordingly, every time a new value is assigned to our property Version, the text view is updated and shows the new version number. ★Now, switch back to the component Application::Application. ★In the middle area of the Inspector, look for its property Version. As you see in the Inspector window from the screenshot above, our welcome screen now exposes the new property Version. You are able to select this property and modify it exactly as you did in the past steps with other properties of other objects. Moreover, the moment you modified the property, the welcome screen is being updated, showing a new text with the just specified version number "2.3". This works automatically because modifying the property triggers the execution of its associated onset method. And, as you remember, this onset method performs code to update the text view with a new string. In this section, we will address the aspect of how to implement the communication between the GUI and the device. In our small example, the device is the coffee machine with a heater and water pump. The user starts the brewing process by simply touching on the play push button found in the selection screen. This intention is communicated to the device, which thereupon activates the appropriate hardware components. 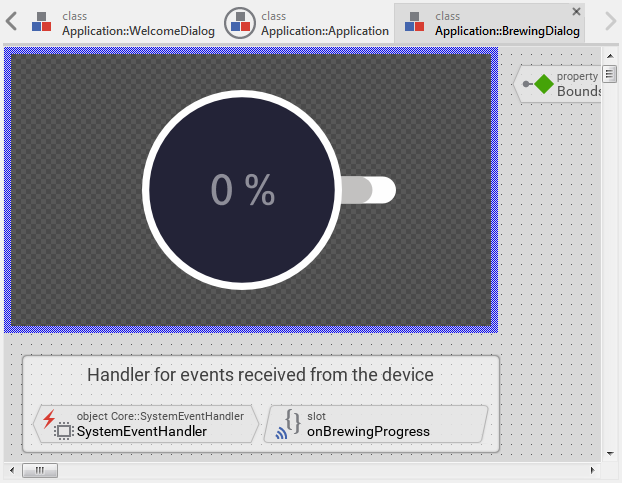 Simultaneously, the brewing screen appears, showing the progress of the operation. The brewing screen remains visible until the brewing is finished. What we would like to have now is a new stop button in the brewing screen, permitting the user to abort the running process prematurely. For this purpose we will enhance the brewing screen by a new button and take care of the communication with the device to stop the brewing process. Let's go! ★As long as the just added push button is still selected, look for its property Appearance. ★Resize the push button to at least 70x70 pixel to show completely its content. ★Navigate to the unit Application. ★In the Gallery window, switch to the folder Resources. ★Press F2 to rename the just added bitmap resource. 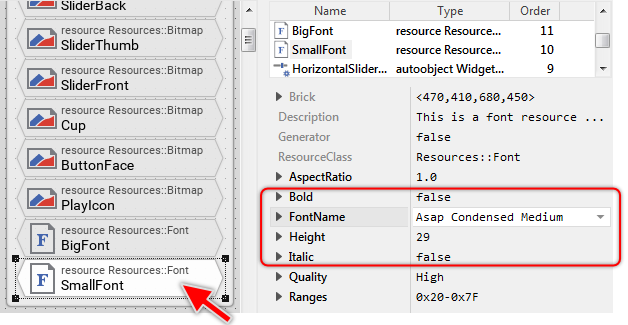 ★As long as the just added bitmap resource is still selected, look for its attribute FileName. ★On the right of the attribute, click on the small icon to open the associated Assistant window. ★In the thereupon shown file selection window, navigate to the subordinated folder Res. 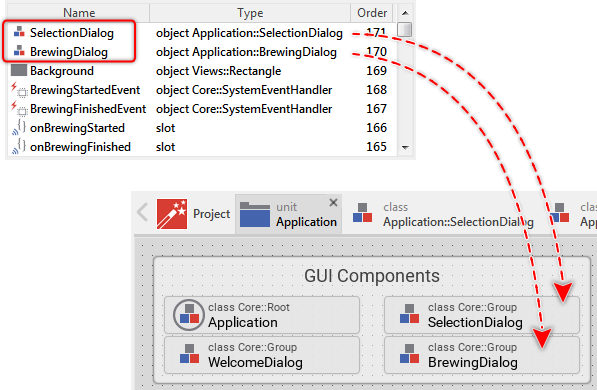 ★Switch back to the Composer with component BrewingDialog. ★Once back in the Composer of the BrewingDialog, make sure that the previously added push button is still selected. ★Switch back to the unit Application. An alternative approach on how you can do it is clicking on the button Navigate to the Unit from the toolbar or (if you prefer) the corresponding shortcut CtrlShiftU. 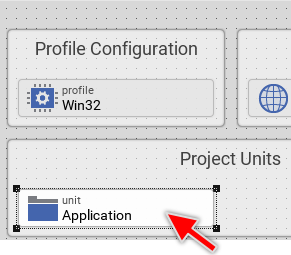 ★Within the unit Application, look for the bricks enclosed in the annotation The interface to integrate the GUI with the target device. The implementation of the method StartBrewing limits to an invocation of an extern C function YourDevice_StartBrewing(). For the moment, let's assume such function exists somewhere in the main software (or middleware) and calling it will activate the heater and the water pump of the device. Much more interesting is the fact that, the external C function is invoked from Chora code. The syntax of Chora and the syntax of C are combined together within one and the same method. Chora programming language is designed to be highly platform-independent and as such, it does not implement any operation to access nor communicate with the device. Instead, you can inject into the Chora method a code sequence implemented in the native syntax of the particular target system. You can combine the Chora and native code. As you see from the screenshot above, the native code is enclosed within a native statement. During the code generation, the code sequence enclosed within a native statement is taken over as it is without evaluating or modifying it. In this manner, you can enrich the platform-independent Chora code with target specific code to control the device. The Chora compiler itself does not evaluate the native code. In fact, it has no idea about its syntax nor function. This means in praxis that, in the application running on the device every execution of the method StartBrewing will call the enclosed C function. 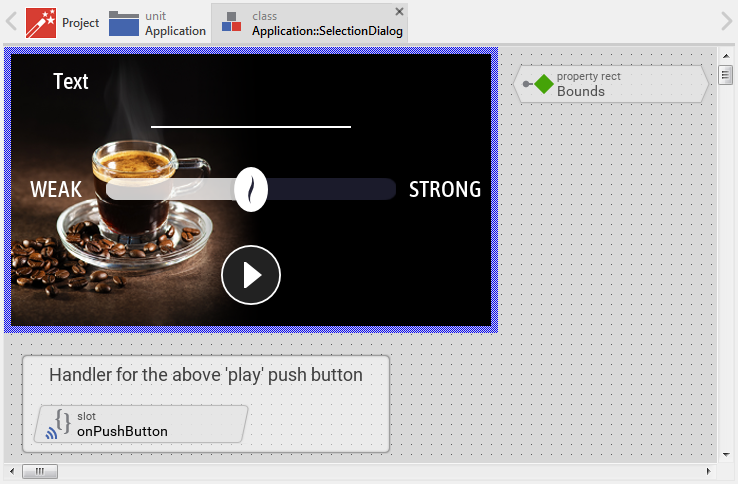 The selection screen, in turn, implements code to invoke the method StartBrewing every time the user touches the enclosed play push button. 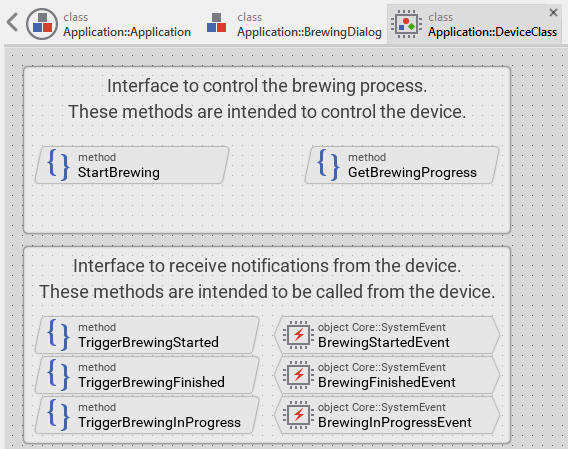 In other words, the activation of the push button invokes the StartBrewing method, which on its part calls the C function to initiate the brewing process. ★Press the key Del to delete the return type. ★Now click on the row containing the method's argument (the row with the text arg int32 aArg1) and delete also it. ★Switch to the Composer page containing the BrewingDialog component. According to this modification, when the user presses the stop button, the slot method is triggered and StopBrewing() is invoked. The expression Application::Device on the left of the invoked method addresses an autoobject (a global instance of Application::DeviceClass). The method is thus invoked in context of this object. ★Test the application. In particular, try to abort the brewing process by pressing the stop button. 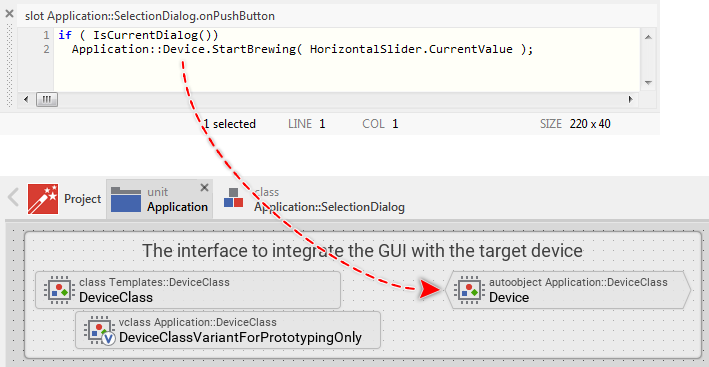 Thus if there is no real device available during the prototyping session, how is it possible to start the brewing process directly in the Prototyper window by simply pressing the play button? Well, the answer is simple: this behavior is simulated. The project contains for this purpose a separate implementation of the DeviceClass containing a timer to simulate the progress of the brewing process. This so-called class variant is used selectively during the prototyping session only and has no effect in the resulting application for the real device. ★Navigate back to the unit Application. From the upper text row in the brick, you will see that the brick represents a variant of the class Application::DeviceClass (the member type is vclass). This means that the implementation contained within the vclass will enhance, override or even replace the implementation found in the original class. Wherever the original class is used, the modified implementation from the vclass is also taken into account. An object instantiated from the original class behaves in praxis as if it would be an instance of the variant class. 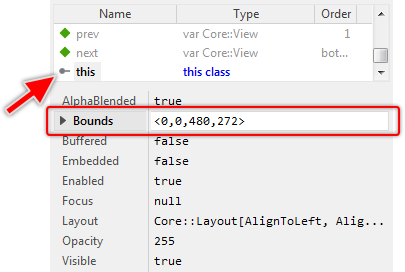 The attribute VariantOf determines the original class, the vclass should override. The attribute VariantCond is much more interesting. It specifies a condition when the variant is taken into account. Actually, this attribute is configured with the expression $prototyper. This expression results in the values true or false depending on whether the application is tested in the Prototyper window or the code is generated for the target system. Accordingly, when you run the application in the prototyping environment, the variant replaces the original implementation of the device interface and adds the functionality for the simulation purpose. When generating code for the target system, the variant is ignored. The variant class appears in a new Composer page with members similar to the ones found in the original class DeviceClass. 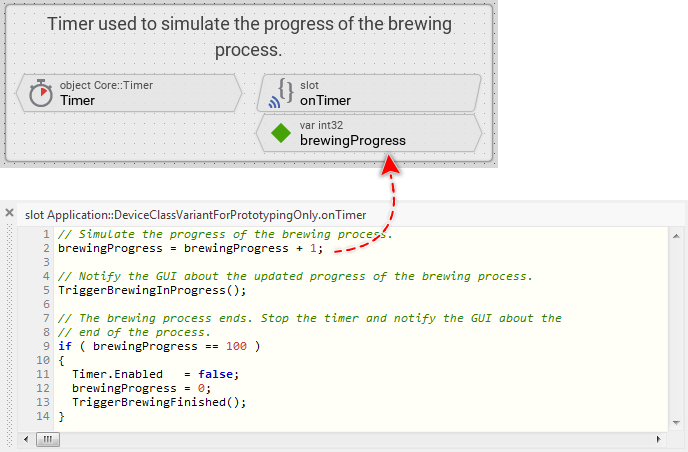 In the screenshot above, you will recognize the methods StartBrewing and GetBrewingProgress that we have analyzed in the preceding steps. These bricks appear with gray text colors, which indicates that the corresponding members are inherited from the original class. They override (replace) the implementation from the original class. The bricks enclosed in the annotation just below implement the functionality to simulate the brewing process. The object Timer drives the simulation and the variable brewingProgress stores the brewing's actual progress as a value in range 0 .. 100. 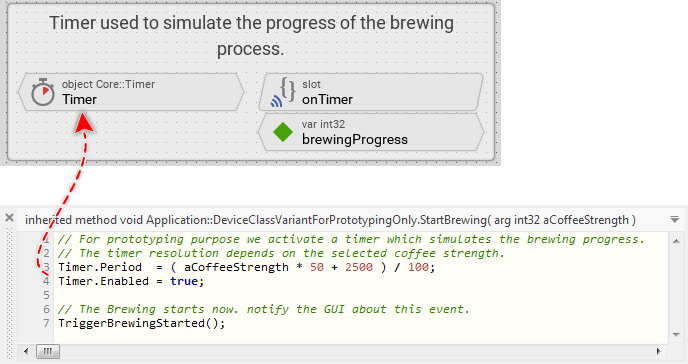 As you see from the screenshot above, the method StartBrewing activates a timer and triggers an event about this device state alternation. Nothing else. This begins the brewing simulation. Please note the calculated timer resolution. In our simulation, the timer resolution depends on the desired coffee strength. The stronger the coffee, the slower the timer and the brewing process takes more time. Every timer expiration signals the associated slot method onTimer, which thereupon is executed. The implementation of the slot method thus drives the simulated brewing process. 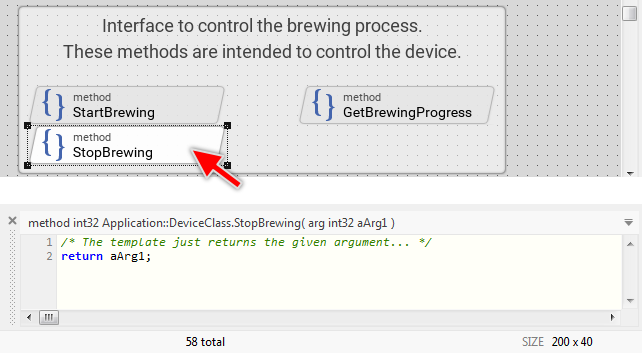 From the screenshot above, you can see the method increments the variable brewingProgress and triggers an event about this device state alternation. As soon as the variable brewingProgress has reached the value 100, the timer is stopped. The simulated brewing is finished. ★In the upper area of the Inspector, look for the member StopBrewing. ★Press and hold down the keys CtrlShift. ★Drag the selected member (while pressing the keys CtrlShift) from the Inspector window to the Composer. 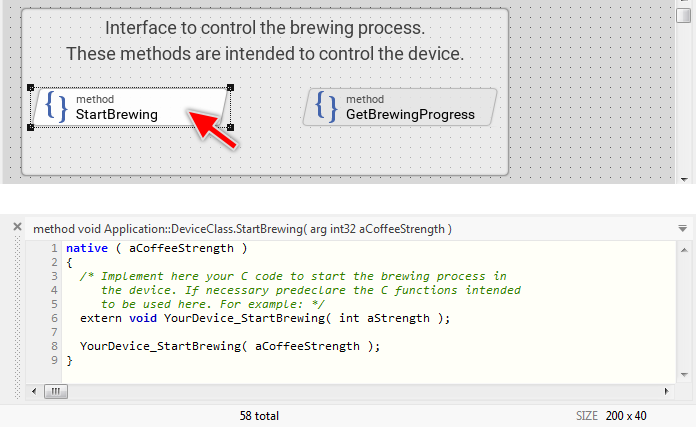 ★Double-click on the member StopBrewing to open its implementation in the Code Editor. // Stop the timer immediately. // Notify the GUI about its abort. ★Try to stop the brewing process. It should work now. ★In the upper area of Embedded Wizard window, click on the tool button Build this profile. If you prefer, you can use the shortcut F8 to achieve the same effect. The code generation is performed according to configuration parameters specified in a profile member. You remember from the beginning of this article, there was a profile member named Win32 existing in the project. This profile was configured to generate code for Microsoft Win32 operating system as a target. 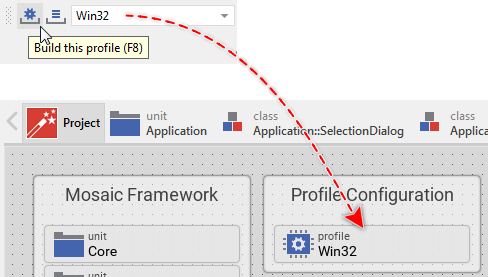 As you can see from the combo-box on the right of the tool button Build this profile, this exact profile Win32 is actually the selected one. In future, if you create GUI applications for different target systems, you can manage in your project several profile members. By selecting the right profile member in the combo-box, you determine the rules for code generation and for the prototyping. Now, let's explore the generated files. Per default, the files are stored in a directory named after the profile member (Win32) just below the directory containing the project. ★By using the Windows File Explorer, navigate to your Documents folder. ★Then navigate to the subfolder Embedded Wizard 9.20\Examples\QuickTour. Please note, if the installed Embedded Wizard is newer than 9.20, you will have to navigate to the corresponding directory (e.g. Embedded Wizard 9.50). ★Open the file Application.c in your preferred editor (e.g. in Microsoft Visual Studio). ★Search in the file for the function ApplicationDeviceClass_StopBrewing(). 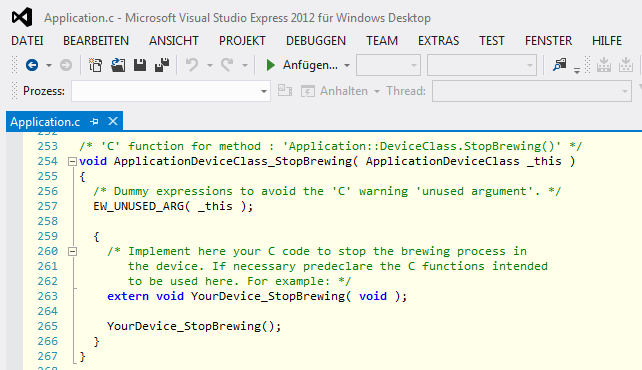 The C function ApplicationDeviceClass_StopBrewing() corresponds to the method StopBrewing that you have implemented within the class Application::DeviceClass in one of the preceding steps. As you remember, this method contained some native code that triggers the device to stop the active brewing process. This code is found within the corresponding C function ApplicationDeviceClass_StopBrewing(). As next step, you would add the generated files to your build process (or make file) and compile from them the resulting binary for the target device. In praxis, the corresponding steps depend on the particular target system. Therefore, addressing this aspect is beyond the scope of this Quick Tour article. Precise instructions are found in the Getting started articles from the documentation Platform Integration. Explains the basic concepts of Embedded Wizard more in detail. Describes diverse workflow aspect more in detail. Addresses the aspects essential for the integration with a real device. 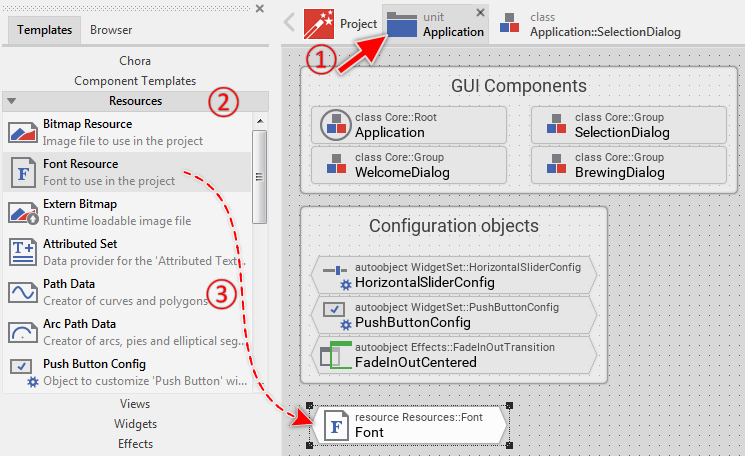 Contains the reference of the Embedded Wizard Studio IDE (integrated development environment) and how you work with it. Contains the reference of the programming language Chora and the bricks used by it. Contains the reference of the Mosaic framework.